InfoCaptor now officially works with Cloudera’s Hadoop distribution and specifically with Hive and Impala. Once you get connected to either Impala or Hive you can perform drag and drop visualization just like with any other data source. InfoCaptor adds native Impala and Hive functionality within the Visualizer so you can leverage Date/time functions for date hierarchy visualizations. The below article will explain how to drill from a bar or pie chart to another chart or table. From the tutorial above, we need to prepare the child portlet in order to receive the parameters for drill purpose. This is true for charts or tables. The key to preparing a “child” or the “drill into” portlet is the use of the filters on the column. You define filters using the “param” variable. At this point both of the portlets are independent. Let us assume we need to drill from the above bar chart to the table below. So when the user clicks on any of the bars it should be able to send the country name that it clicked and send that to the detail portlet. Drilling into Bar or Pie chart involves few more steps than the just drilling between table to table. 1. Prepare the “Drill Into” or the child portlet. Click apply and it will show no records as it is now dependent portlet. Explanation of the format: When you click on the bar chart, the bar transmits two values, one is the actual number value (y axis) and the second is the country name (x axis). The number 2 represents the X-axis value and since in most of the drill you need the X axis value we tell it to transmit the second value first. click apply and your drill is set. When you click on the bar, the child portlet will automatically align just below the bar chart. Similarly you can drill from a Pie chart as well. Other charts are not drillable. When you build website wireframes or prototypes, clickable mockups is a standard requirement. Most dashboards consist of a series of charts and tables, neatly arranged in an organised layout. Generally these charts are related, as they will all deal with particular aspects of a larger over-arching topic. In many ways a Panel Chart is a microcosm of a larger dashboard. It is made up of a collection of charts laid out in a geometric panel-like arrangement, and in the majority of cases all of these charts will be very closely related to each other. It is very easy to create a panel chart using Excel. While some tutorials may recommend a complicated approach, involving the creation of a single chart which contains a number of smaller charts within it, this actually requires a lot of formulae and other set-up time. A much simpler solution is to simply generate each of the small charts individually and then arrange them in a panel formation on your worksheet. When creating your smaller charts the standard approach in Excel is used. Simply choose the type of chart you require and fill in the relevant data. As you are creating a panel chart, each of the other smaller charts will mirror the structure and style of your initial chart. Therefore it is a good idea to create one chart, format it as required, and then copy it to create the additional charts. A quick way of copying a chart is to click on it and then press CTRL + D. Of course each new chart you generate will need new source data, which can easily be adjusted in the usual way. A very important aspect of panel charts is that they allow for good comparison between different elements of a data set. However this is only effective if the scale of all of the charts are identical. If the axes are set to different limits, visual comparison is automatically affected. Therefore it is essential that all axes be set to the same maximum and minimum limits for all of the charts. Once all your charts have been designed, it is a simple matter to line them up in the layout you require. 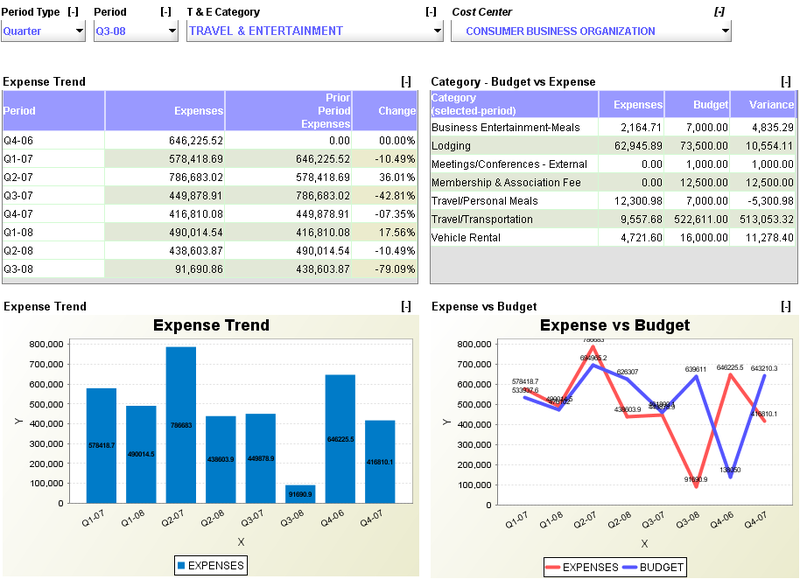 The visual medium of an Excel dashboard makes it a highly effective business intelligence solution when used correctly. However dashboard creators need to be very careful when deciding on the layout of their display. A badly laid out dashboard can be difficult to used and to understand, and can in some ways be almost completely useless. However a well laid out dashboard can transfer a large amount of information to the user, while still remaining clear and easily understood. The fundamental conundrum that confronts the designer of a dashboard is how to provide sufficient information, without cluttering the dashboard too much. This problem is easily solved however using drill down features. Drill down features allow additional information to be included in the dashboard, without having them clutter up the display itself. The Excel Dashboard software offers a range of drill down features, which can be included in any chart. If you wish to make a good sales dashboard, there are a number of things you need to consider. On primary consideration, you will want your dashboard to of course let you know whether sales are up or down. While this should of course be the focus and ultimate aim of a dashboard of this type, fixating on this aspect can in fact be a mistake. 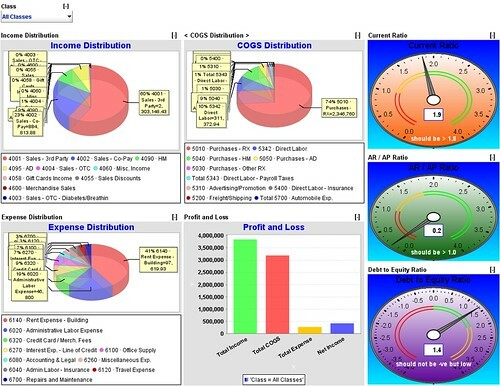 Many sales dashboards make use of gauges to demonstrate whether sales have increased or decreased. However this leaves out a large amount of information, which will probably of use. A line chart demonstrating a visible trend line will be much more useful than a gauge chart, providing you with an overview of your business’ historical performance. However avoiding using gauge charts is not the only error that can be made when creating a chart of this kind. While you will need a chart that displays your sales trend, you may wish to find out what exactly has caused your decrease or increase in sales. The vast amount of sample sales charts seem to focus almost exclusively on performance, without providing sufficient background information on the various elements that contribute to these results. A well laid out sales dashboard should provide information on sales demographics and other KPIs that influence your sales numbers. They should also make use of charts that can give clear comparisons. When creating a chart for a dashboard or another business intelligence software solution, there are a number of factors to consider. Not least of these is how you go about ordering your data for display on the chart. It may seem like this question has on obvious answer, but in fact this can be a complicated issue, which benefits from thought, consideration, and experience. If your data set has time as a variable and you wish to display a coherent time line, then data sorting is not an issue. You can simply allow one of your axes to represent time and lay out your data chronologically. The difficulty arises however if you have a set of data points taken at the same point in time, or if you do not want to take the chronological approach. At this point you may be tempted to opt for an alphabetical layout. Surely your dashboard will gain from an additional level of orderedness, and your results will be more clear and coherent? Unfortunately this is not the case. In many situations there is a specific pattern or order already contained in your data, which will be instantly revealed if displayed in the right way. When it comes to sorting data for a dashboard chart, there are a number of things to look out for. Firstly, you should consider if there is any form of order or logic that can be applied to the data you have collected? Can you group it based on gender, magnitude or some other factor? It can help to consider the overall aim of your chart. What are you trying to tell people? How is your data relevant to your dashboard as a whole? All of these considerations will help you when you are laying out your chart, and will also help you to choose appropriate chart types for specific data sets. When using business intelligence software you are bound to come across countless line charts. These are undoubtedly some of the simplest and most common charts in use at the moment, especially on dashboards. Line charts are by nature simplistic, uncluttered and clear. Nothing can be more straightforward than a trend line, visually representing progress over time with a single line. If you choose to use a line chart in a dashboard, it is important that you appreciate the simplicity of this approach. Like any chart, a line chart should state its information as clearly and succinctly as possible. You should never try to add to a line chart in any way. Any added features will just clutter your chart and reduce its overall effectiveness considerably. When creating a line chart, try to keep labelling and text to a minimum. Of course your chart should have a title, and each axis must be clearly labelled. Units should also be displayed. However you should make sure that this text does not dominate the chart. It should be coloured in such a way that it is clear, but not so that it is attention grabbing. However you should also avoid legends of any kind. If you have more than one series on a single chart, label each one directly and briefly. As the goal with all charts is to avoid clutter, you should try not to have too many series on the same chart. If these trend lines are overlapping each other or passing very close together it will be difficult to get a clear overview of the data. If you do use more than one series, make sure that each trend line is coloured so that it contrasts sharply with its fellows. If one of your axes represents time, make sure that all data points are equally spaced. If you do not do this, users will get a false impression of the timeline. You should also be aware that axis limits are variable. Choose the range of each axes based on the data at hand, and fit it appropriately to best display your data. All dashboards depend heavily on charts. Therefore when you are creating a dashboard, it is advisable to spend some time preparing beforehand. 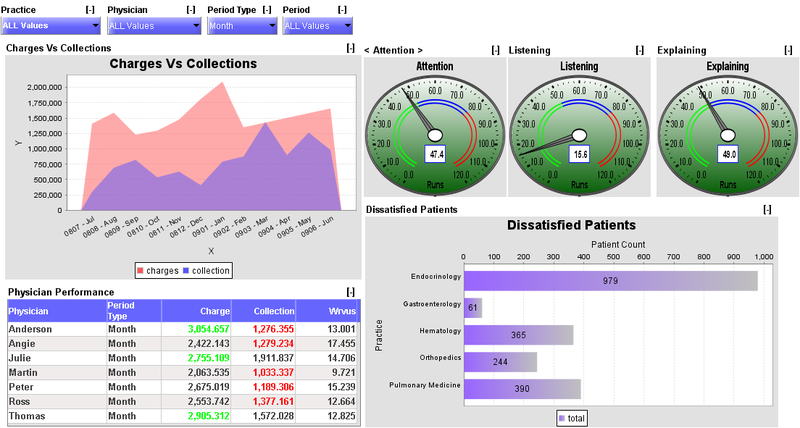 Examine your data and make sure you are certain exactly what sort of information you want to gain by using a dashboard. It is only when you have done this that you will be able to choose appropriate and relevant charts. There are of course some important points to remember when creating a chart. You will need it to be concise, clear and relevant. It is very easy to create a simple chart, but it can be more tricky to choose a chart layout that best suits your needs. For example, it is important that you do not plot all of your data. If you are laying out a business dashboard, KPIs will most likely be foremost in your mind. All charts should focus on providing a clear and relevant overview on performance. This will therefore mean that much of the data generated by your daily business can be safely ignored. Conversely it may be the case that you have insufficient data to generate a particular chart. You will want your chart to be meaningful, not just in itself but also in the greater context of the dashboard. If you do not have enough data to indicate any form of trend or pattern for a certain chart, you may want to consider omitting that chart as it cannot be contributing to any form or overview. However it is also very important that you do not clutter your charts either, by including too much data. Some data clusters can be represented by a single data point, if you wish to create a general chart depicting an overall trend. Remember clarity is one of the most important aspects, and cluttered overloaded charts are anything but clear. Selecting exactly which data to chart and how to chart it is a skill in itself, which can be developed with practice. If you feel that certain data absolutely cannot be omitted, the drill down feature can be used to include this data on another layer. A final important aspect to remember is that your dashboard is designed to be viewed as a whole. You should therefore try and keep charts that are related to each other together, so that they can be viewed in direct comparison. This helps with analysis and decision making, as a selection of different factors and effects can be seen at the same time. It is also possible to see how these factors relate to each other and contribute to performance. The Dashboard is a business intelligence solution that has taken the business world by storm. IT departments in almost all major organisations are now responsible for creating and maintaining a wide range of dashboards that are distributed amongst the various executives, managers and workers. The benefits of using dashboard solutions are clear, and it is by no means excessive to say that those who do not choose to use business intelligence software today are now in serious danger of being left behind. However although there are so many widely discussed benefits to dashboard software, there is also one large risk which every company and individual should consider before they invest in any form of dashboard. This risk is of course Data Security. Once you have your dashboard set up and functioning properly, you will have to grant it access to lists of data in order for it to formulate and maintain its charts. If your dashboard updates on-the-fly, you will have to grant it real-time access to all of your relevant data files so that it can update your reports as events happen. While this is not a problem once only certain approved colleagues can view this data, it can become a huge concern if an unauthorised person were to gain access to your dashboard. If a competitor were to gain access to a company’s dashboards it could prove disastrous for the business involved. Therefore security is a huge priority in business intelligence development, and great pains are taken to ensure that all data is protected at all times. With ExcelDashboard and with all Infocaptor products, security is provided on a number of levels. Data access can be limited according to preset categories, groups and roles. There are also integral Dashboard parameters that help to protect your data at all times. Certain database features also contribute to the overall security of both your data and your dashboard, ensuring that only the right people see your data, your reports and your analysis.